The Bonsai Cacoon in Leaf Green is the smallest Cacoon chair in the range. Ideal for a child's bedroom or simply the best addition to any sturdy tree branch! Somewhere the kids will be happy to "Hang Out" for hours. It’s for after that hard day at school, or somewhere fun to chill out with friends. You can use it outside in the summer and inside during the colder months, it also comes with a handy carry bag so you can transport it... pretty much anywhere you like! Brand: Cacoon. Inspired by Mexico, designed in The Netherlands. Husband and wife team Nick and Sarah make sails for ocean-going yachts... usually! More recently they’re designing unique Hanging Tents called Cacoons. 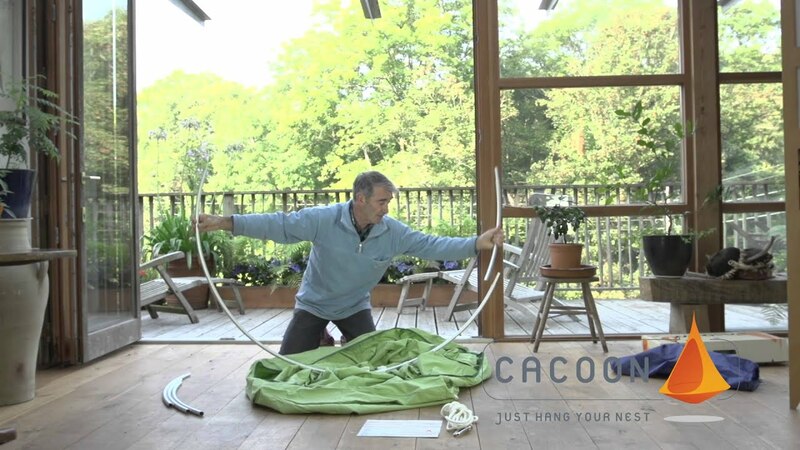 In sail making, work took them to some pretty exotic locations, one such location, Mexico, inspired the idea that is now Cacoon. Nick, who started out as a fine furniture maker, is no stranger to creating unique tensile structures with fabric having worked on projects like The Eden Project and the Alpine House at Kew Gardens, and he had been commissioned to create a post-treatment relaxation chair or hammock by the luxury Spa Hotel in Cornwall 'The Scarlet'. Whilst out walking in Mexico, they came across a colony of weaver birds busy building their tiny woven hanging nests – their strong, safe bolt-hole in the jungle. This was the moment inspiration struck and by combining their furniture making expertise with complex sail cloth technology, 'Cacoon' was born. Like the weaver bird, you too can be hidden away and sheltered, comfortable and relaxed, cocooned alone, or together, in your own private world. A Cacoon in Cuckooland... its got a nice ring to it!